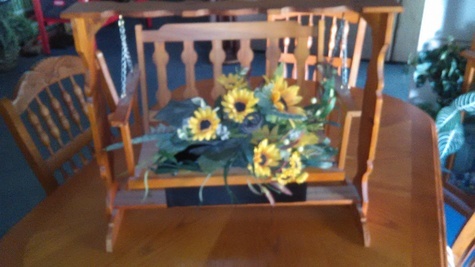 This is a small Wooden Swing With Sunflowers that will brighten up your home. It will beautify any room in the house as it catches everyone's attention as they walk by. It's in excellent condition and is not real small as you can see by the picture of it sitting on the kitchen table.